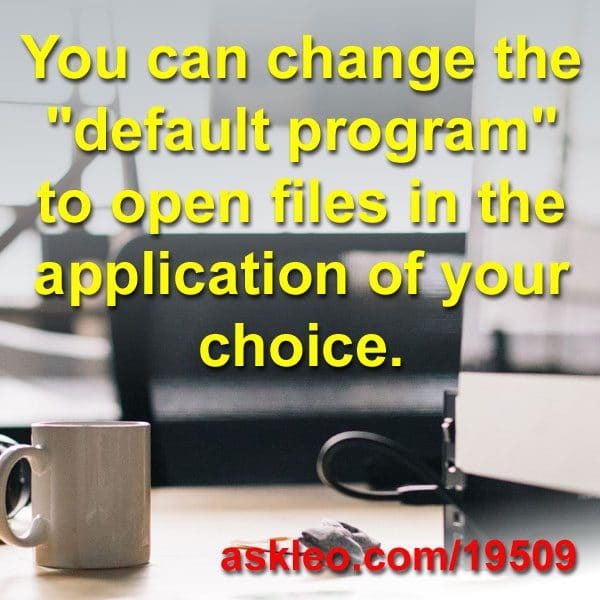 You can change the "default program" to open files in the application of your choice. - Ask Leo! You can change the “default program” to open files in the application of your choice. How Do I Change the Default Program to Open a File? - Change the default program to open files in the application of your choice. How Do I Change the Default Mail Program in Windows? - The default mail program is used to send email at the request of other programs on your computer or links on web page. If you use a web interface, however, things get tricky. « Previous post: “No Signal” does not come from your computer. This is your display device indicating that it has nothing to display.